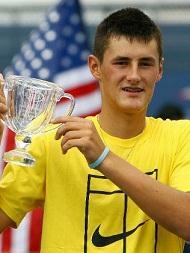 Bernard Tomic is an Australian tennis player who turned professional in 2009. Only at 16 years old he made his debut in 2009 in Grand Slam context by reaching second round of the Australian Open. To know more about this Australian tennis player, read this full article. His debut in the Junior Circuit case in 2006, when he won four tournaments and won 26 consecutive matches before losing in the second round in Morocco. In 2007, lost the second round at the U.S. Open Junior and finished the year ranked in the 23. In 2008, requires the Australian Open and in 2009 won the U.S. Open, thus ending his career at the junior level. Tomic made his debut on the ATP tour during the ATP tournament in Brisbane in 2009 , where he was in the first round 6-4, 6-2 lost against the Spaniard Fernando Verdasco . He was granted another wild card for the main draw of the ' Australian Open, which eliminates the first round Potito Starace with the score 7-6 (5), 1-6, 7-6 (5), 7-6 (6), also saving two set points for the Italian in the tie-break the second set. In the second round meets Gilles Muller, who won in four sets 6-3, 1-6, 4-6, 2-6. It imposes for the first time a challenger in Melbourne, and later received a wild-card for Roland Garros , where he was eliminated by Philipp Kohlschreiber. Loses in third round of qualifying for Wimbledon and the year ending ATP ranking of 286. Tomic started in 2010, through a wild card, again at the Australian Open . After a smooth 6-3, 6-4, 6-4 over the qualifier Guillaume Rufin, he lost in round two, just in the fifth set against the number 14 set to Marin Cilic . 2011 he was also successful at the Australian Open in entering the third round of the tournament, where he joined Rafael Nadal had to admit defeat. After the Australian Open, Tomic played mostly Challenger with varying success. A great leap forward in the rankings, he managed to Wimbledon , where he won seven games in series including qualification and only in the quarterfinals at the eventual winner and world No. 1 Novak Djokovic failed. He was the youngest player since Boris Becker , who reached the quarterfinals at Wimbledon. Among other things he managed it a victory against the top 10 players Soderling. On this success he was able to join later in the season gone, but with partial success in the ATP tournaments in Tokyo and Shanghai, he worked his way up to rank 41 in the ATP rankings.